Within a draw conducted by the government of British Columbia. The Invitation to Apply (ITA) for Provincial Nominations were issued to 358 Express Entry and Skilled Immigration candidates. These were the invitations which have been provided for the Express Entry BC International Graduates categories & Express Entry BC Skilled Workers. Also, the candidates who received be effective profiles, i.e. should be active in the Canada Express Entry system. The Express Entry system is introduced by the CIC. It is an electronic and point-based system, candidates need to score a minimum 67 points on the Express Entry(EE) grid. The federal economic immigration categories of EE are Federal Skilled Worker Class, Federal Skilled Trades Program and Canadian Experience Class. Candidates who received the nomination from the Provincial Nominee Programs are granted with an additional score of 600 points towards their Comprehensive Ranking System or CRS Score. These points boost up the candidate’s profile and help in receiving an ITA for PR in further Express Entry draws. 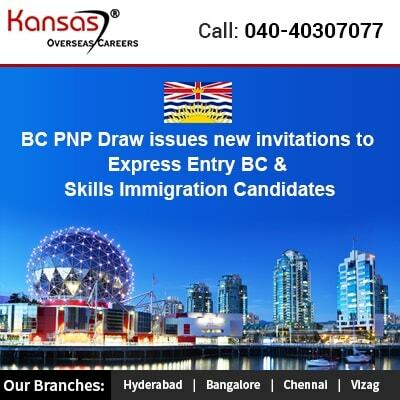 Candidates who have got invited from the Express Entry Skills Immigration & BC should have an undetermined job offer with full-time access from an organization belonging to the province. However, the IRCC process the Canada PR separately. Apart from the Express Entry for the candidates who received a nomination from the BCPNP Skills Immigration Stream. Hence, for availing nominations for Canadian Immigration, interested candidates have to apply under the Express Entry Streams & Skilled Immigration and need to create an online application by using the online system of British Columbia Provincial Nominee Program. After completing, need to submit the registration form. The candidate’s profiles are processed and provided with a score, based on factors age, work experience, education and many more. If you are planning for Canada Immigration with less information known, it is better to opt for an Best immigration consultancy in India. Also, get an assistance from leading immigration agents about the immigration programs and their process associated.